Today is the first day of whale watching season. Of course no one told the whales that. Even though our training trip for the Cabrillo Marine Aquarium’s whale watch naturalists didn’t spot any migrating Gray Whales, there was lots to see on the Voyager out of Redondo Sportfishing. The weather was wonderfully calm with low swells and glassy calm water. The scant but persistent clouds were a little bit of a downer, making the water look inky-black most of the time, but then again, I liked the slippery look of the surface. The first cow/calf pair was spotted on December 20th by the census! The total number of whales spotted since the beginning of the season is 37 (36 southbound, one strange fellow going north). Fin Whales may still be in the area, but possibly a bit further out in the channel. 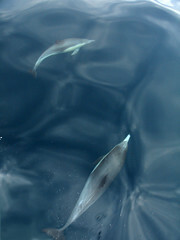 At least a dozen different small groups of feeding Short-Beaked Common Dolphins. One group was only a hundred yards or so from the Redondo Beach breakwater. Sea Lions a-go-go – I think I saw more sea lions out on the water than I ever have before. Some were rafting and throwing their fins up in the air to thermo-regulate, others were hopping out of the water (and causing some mis-identifications as they’re easily taken for dolphins at a distance when they do that). Lots and lots of birds: Sooty Shearwaters, Brown Pelicans (many in breeding plumage), Heerman’s Gulls, California Gulls, Western Gulls & a Rhinoceros Auklet (okay, it was pointed out to me, I’m not sure I could identify that one on my own). Previous Offshore Reports: 12/13/2006 & 12/6/2006 . More photos here. Previous PostPrevious Anyone want to take over LA Photobloggers?